Looking to ease those post-summer blues? With average temperatures reaching around 27 degrees year-round there is no better time to book a holiday to St. Kitts. From snorkelling in crystal-clear waters to hiking in lush rainforest or kicking back on idyllic beaches, St. Kitts offers the perfect Caribbean getaway, with something to suit every taste. The latest hotel to open in St. Kitts, Park Hyatt made its Caribbean debut after opening its doors to the public in November 2017. It is home to the first Miraval Life in Balance spa – a state-of-the-art oasis offering luxurious, relaxing treatments. One of its most exceptional features is the outdoor meditation and yoga space, which has been constructed to mirror the island’s historic conical sugar mills. Drift away in this calming oasis to the sound of the ocean under the blue Caribbean sky. For further information visit www.miravalstkitts.com. Ital Creations at Fari Organic Farm is a local family-owned vegan kitchen dedicated to bringing a healthy choice with a taste of the Caribbean. Located on an organic farm, visitors can take a walk, sit under a mango tree and relax. Each afternoon a yoga class takes place on the farm, taught by certified instructors, so visitors can experience St. Kitts in a healthy, friendly environment in Basseterre. For further information visit www.stkittstourism.kn/stay-dine/food-and-drink/ital-creations. St. Kitts’ clear, turquoise waters are ideal for a day of sailing aboard a luxurious catamaran and discovering natural reefs. What better way to see the island than as the sun goes down, cocktail in hand, drifting along the pristine seas? There are a number of ocean excursions available including a Twilight Sunset Tour with Coastal View Charters (CVC), a two-time award winning Luxury Boat Tours and Charters Company in St. Kitts. Cruise the coastline of the southeast peninsula while enjoying a complimentary bar and hors d’oeuvres. For further information visit www.stkittstourism.kn/activities/excursions. Two of St. Kitts’ hotels offer full-service spa facilities to rejuvenate the mind, body and soul with an endless array of treatments and wellness programmes. Unwind at the Emerald Mist Spa at St. Kitts Marriott Resort where natural, holistic ingredients including sweet orange, papaya, mango, coconut, sea salts, bamboo – and even volcanic rocks – are used to enhance this Caribbean spa experience. Signature treatments include a bamboo massage and skin brightening mango passion fruit body bliss. For further information visit www.spa.stkittsmarriott.com. There are a number of ways to discover the island of St. Kitts, and for those that enjoy a challenge they can hike up its highest peak – Mount Liamuiga. This dormant volcano is a unique adventure passing through waterfalls, the tropical rainforest and the cloud forest at higher elevations. The spectacular view from the peak is a rich reward for this four-hour guided hike. For those that want to stay on the ground, a guided rainforest tour is a peaceful hike giving holidaymakers the chance to spot local wildlife. 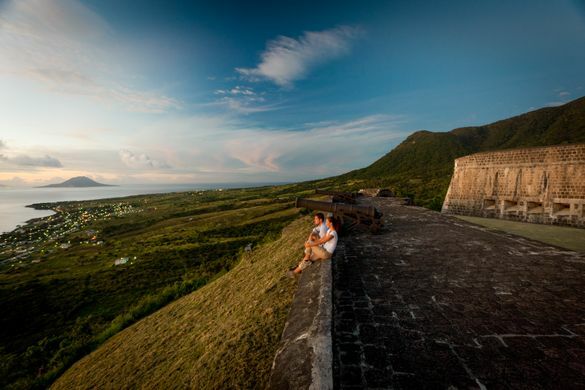 St. Kitts is the authentic, quintessential, year-round Caribbean destination for the discerning, experienced traveller. Intoxicating unspoilt natural beauty, sunny skies, warm waters, and white sandy beaches combine to make St. Kitts one of the most seductive spots in the Caribbean. Located in the Eastern Caribbean, the island is easily accessible for British travellers with twice-weekly British Airways flights from London Gatwick (with a short stop in Antigua). For further information on St. Kitts, visit www.stkittstourism.kn.